Please follow me there, and always feel free to email at mitchforgie@hotmail.com! Stronger Kamloops is now a book! Read it, download it, print it, distribute it! Available for free at issuu.com and link is provided above and below. It has been a very long time since I have wrote on this blog, as I have been very busy trying to work on Laneway Homes, been writing a book and generally working very hard. In the spirit of Charles Mahron of StrongTowns.org I have been doing some case studies in Kamloops in regards to the financial affairs of our city, the liabilities that we do not see reflected in the cities capital plans and the return on investment the public sector sees in different areas of the city. I do not want to say too much, only to provide the figures as I have found them, and let the figures speak for themselves. Currently I have asked an accountant to audit these figures for accuracy, and the figures gathered are based on a number of sources outside of my control. I have received all tax information from the BC Assessment Website between January of 2013 and June of 2013. The tax rates and budget figures are based on the 2013 Kamloops City Budget as obtained from the cities website. The figures shown here for taxes collected assume that there are no home-owner subsidies made. Cost of Infrastructure improvements was gathered by a BC Ministry of Transportation Document titled “Construction and Rehabilitation Cost Guide” 2013. Size of properties is gathered from the cities online property information system and survey. For the first two case studies I choose to use Cul-De-Sacs. In this way it can be argued that the only tax-payers who receive a benefit from this infrastructure would be people living on that street, people accessing people who live on that street, and people who are lost (who arguably are not receiving benefit from that street in their usage). I believe that in all ways I have tried to show the best case scenario from the city administrators point of view. Seen above in Google Street View, and on Google Maps, Canongate Crescent is a typical Aberdeen subdivision, with above average home prices. The average property value is $420,882.35. The cities mill rate tax is 4.37%. This, with no subsidies, bring in revenue of $62,534 per year. The cities financial plan for 2013 shows Infrastructure budget at 6.89% of the total budget. If applied to this street, that allows $9076 of this streets taxes allocated for infrastructure costs. Let us for the moment assume that the residents of this street do not contribute ANY of their infrastructure taxes to any other street in the universe. Based on projections provided by the MOT and compared against city projects in 2012 of a similar size (Grandview Terrace), it is estimated that resurfacing this street would cost $702,000. This would be the minimum treatment allowed by city and provincial codes. This treatment is expected to have a life-cycle of 15 years until needing re-surfacing again. The governments minimum code for road re-surfacing (50mm deep) costs on average $117,000 per lane per km. If the resurfacing was done this year, the cost would be $702,000. With revenue coming in for the street from the properties adjacent at $9076 per year it would take 77 years to pay for the project. If we take the governments number of 15 years until replacement, that makes the shortfall on the project $565,860. Looked at another way, the shortfall is $37,724 per year; or $1109.53 per household per year. Looking at it yet another way, with the same current budget proportions, and with the idea that we would want every house to at least be able to maintain the road service in the front of their own house, each persons taxes would need to increase from an average of $1839 per house per year, by $1109.53 to a per year per house tax payment of $2948.53! That is a 55% increase in taxes immediately, just to pay for the road in front of the house. Kyle Drive in Westsyde, bisects Westsyde Road and on the west side creates a little Cul-De-Sac. I have chosen this Cul-De-Sac for the same reasons as the last. 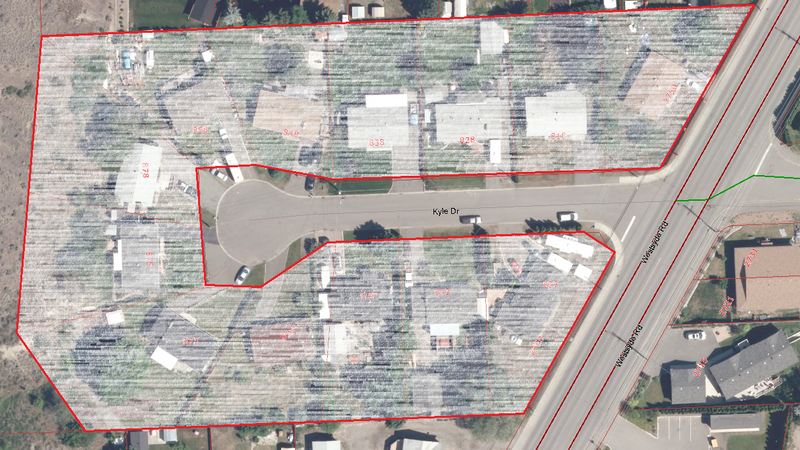 Kyle Drive contains 11 properties, with a total taxable value of $3,223,000. 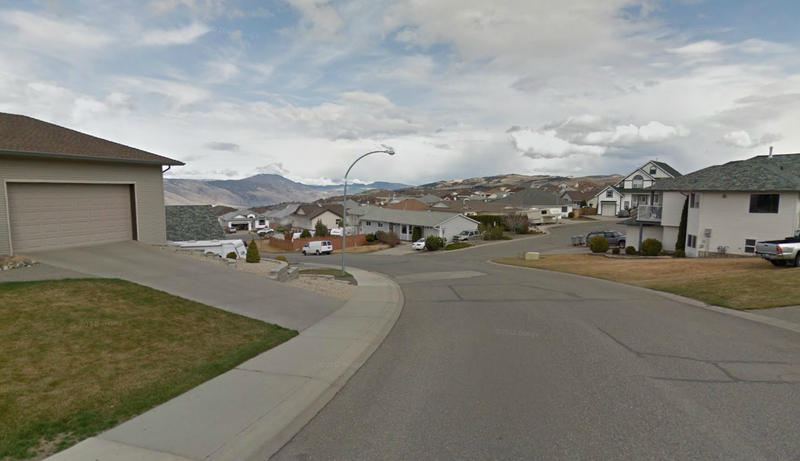 The average home price is just below the Kamloops average, with the average Kyle Drive property worth $293,000. The income from property tax on these properties is $14,084.51 and the infrastructure budget from this number is $957 per year. To change things up, in this example I used Hot-In-Place Recycling as the payment method, which has a useful life of 9-11 years. The government expectation for HIP is $54,000 per km per lane (Lanes being 12′ wide). Using the same type of figures as the last example, it takes years for these tax payers to pay for the re-surfacing of the road in front of their homes. The loss calculated based on a 10 year life-cycle is $6,630 or $663 per year. The tax increase that would need to happen immediately to break even on the re-surfacing of their road is $60 per year per house. It is important to note that within this infrastructure budget the city still needs to pay for water and sewer lines, the far more expensive arterial roads, and all the other paraphernalia involved like water treatment plants, pumping stations, road signals, engineering, on and on…. Consider that every transaction in our whole city falls under similar circumstances. Part of the book I am assembling at the moment includes dozens of these examples. We are concerned about our 2% tax hikes each year, but with these figures we can absolutely know that we have a ticking time bomb of 50% and 100% tax hikes in our future. There is nothing that can be done to solve this problem, but there are things that we can do to react to the choices we have made more sensibly than others. This blog is a good place to start and my book will involve many value capture techniques for the private and public sectors. Losing the Thompson Park Mall was certainly no great loss, but the question is, how good is what replaced it? What kind of value does the new mall capture? What motivations influenced the design of the mall? Who does this mall serve, and how well? I have to say, the mall serves primarily the urban clientele downtown, and does a fairly good job, with many pedestrian crossings to connect to the existing sidewalk. There is also less allocation towards parking, as compared to say a Sahali or Aberdeen stripmall. This is a step in the right direction. The quality of the design is fairly consistent and aesthetically pleasing as well–The oranges, reds and beige’s well reflect the natural palate of the grass lands. The lighting is appropriate, at night the area is not flooded with Halogens, but is rather sensitively lit with human scaled street lights and wall scones. In addition there is also attempts to mass the structure in such a way as to not impose its gigantic scale upon the pedestrian, mostly by thrusting the block between 5th and 6th partially into the parking lot with London Drugs, to obscure the true length of the building. 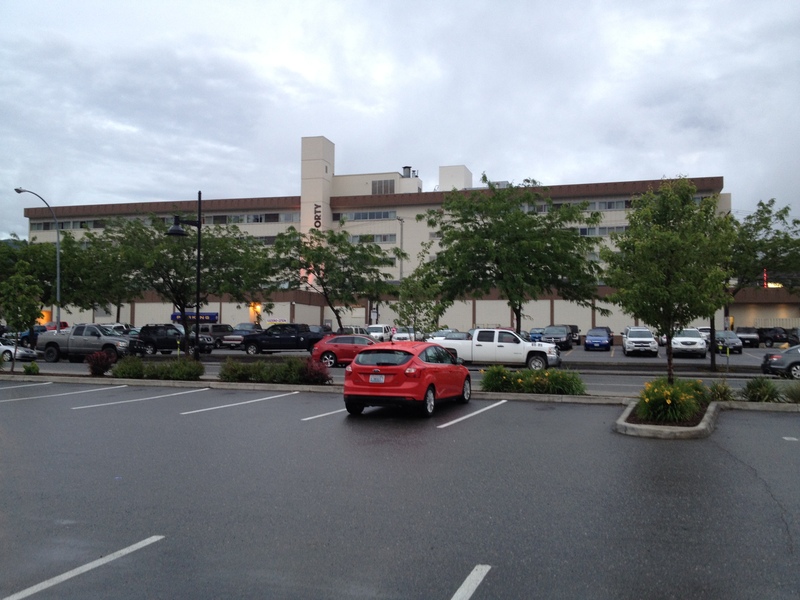 Circulation for cars within the parking lot is inefficient, but interface with the rest of the city is pretty good–that is if your primary concern is getting cars in and out, particularly in. In this regard it is the one-way orientation of Landsdowne Street that is the least efficient; Now many vehicles find it easier to use the parking lot as a counter flow street to Landsdowne, creating congestion within the parking lot. The thrust of this article surrounds the “Public Space” that was created between 4th and 5th avenue in front of what is currently Dollarama. It is pictured below. So with that said, the thought was there, and many elements of design, urbanity and human scale we’re addressed. But as I unfortunately tend to, I am going to focus on some of the design elements that the public hearing process, the design review panel and the architects and planners seem to have forgotten, or not capitalized upon. This development was obviously planning to create a comfortable pedestrian environment. It shows in the “street” which tucks behind Senor Froggies, Bell and a couple of vacant locations, in front of Dollarama. This area has some interesting streetscaping, and plenty of benches provided, but is unfortunately devoid of pedestrians, and actually in many places shops. This contributes to a somewhat dangerous feeling to the space, and it is common to see persons avoid this area to instead walk through the parking lots to pass this area. Why? Why does no one want to walk here? The area has no entrances for the shops facing the street. There is large blank walls, back doors and generally nothing of interest to bring a pedestrian into the space, making most of the available real estate not viable for businesses. The same is true of the still existing basement level, which is devoid of people and businesses (and also has large private maintenance fees for “public space”). Furthermore, the “street” is not a conduit, it does not connect anything to anything else. So this place functions neither as a destination, nor as a place of transit. Therefore there is no idle reason to be there. It does not even connect meaningfully to the existing street network, where persons and cars may be idly passing. It is separated by a 4 deep parking apron and landscaping that further prevents integration with the existing city element. Could this space have been redeveloped differently and achieved a different result, with higher rents, and breed more successful business? I would argue that it could have done this, and even avoided the investment in the ill-utilized public space “street”, and instead used that square footage for parking or revenue generation. This development terminates the vista for not one; not two; but actually three streets. 4th, 5th and 6th all terminate in this development, and not one terminating vista serves a civic, legible, land marking presence. Each and every visitor to downtown Kamloops cannot fail to visit the Third Avenue pedestrian bridge. In fact on a Google image search of Kamloops, the Yellow Bridge is the most photographed single structure in Kamloops. This is because it terminates a vista down a street. It is therefore obvious, eye-catching and serves as a landmark. The installation of the transit exchange at 6th Ave could have served this function, could have terminated 6th in a fantastic enclosed space full of people waiting for the bus, busking, and just enjoying this island in the grid. All the way from Columbia a visitor to Kamloops could have looked down Sixth, seen the buildings and the people and understood that this was a place of retail and a good place to visit. In its current layout, a visitor looks down 6th and wonders if this is really the turn to the “City Center”, because they have had no indication of this looking north down the avenues thus far… except for the bridge terminating 3rd. This option was available at each and every intersection, however it was not taken advantage of. Moving forward, the developer could invest in some archways over each entrance to the space which would at least partially terminate the vista with something informing and potentially beautiful. No gigantic pillars, no gigantic signs. This is an urban area, traffic speeds are slow, and its is safe and easy even for a motorist to glance at a reasonably sized sign and understand that yes, there in fact, is London Drugs, as it only takes up half the city block anyways. Especially if these spaces we’re built to the pavement, all sorts of complex interfaces could have made the store fronts visible and inviting and context sensitive–for example, sidewalk chalk, clapboards, planters, patios, etc. Unfortunately the mall is not scaled to pedestrians, and is thus avoided by all but those that have a destination within the mall. So think of the traffic and word of mouth that the businesses here are missing out on. Think of the public space that was created, that all the businesses have to help pay for, which is completely un-occupied and serves no purpose. Some of the businesses, terminating the vistas, could have even been seen easily from as far away as Columbia, and thus demanded much higher rents from the landlord. 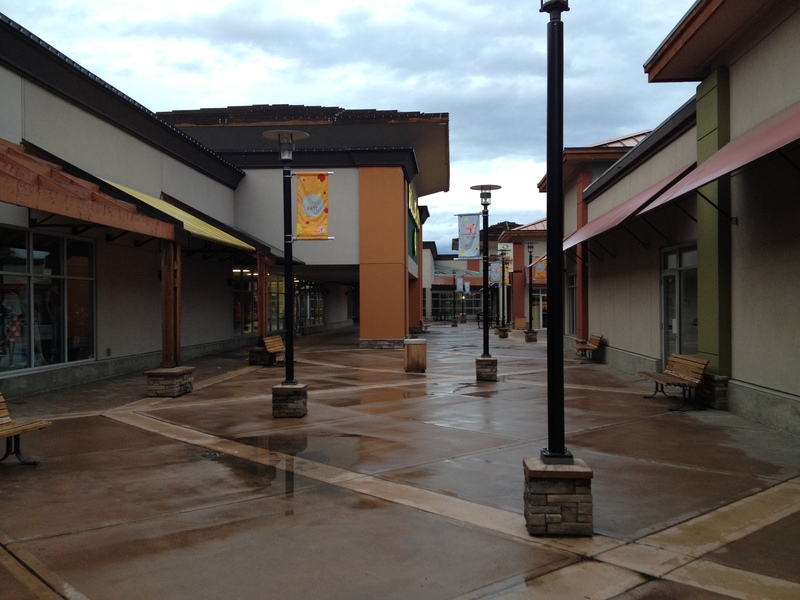 The higher property values in the development could have meant much larger influxes into the public coffers, with less maintenance expenditure on the part of the businesses. That is capturing value, for the customers, the businesses, the public realm and for our taxes. Does this building really serve its stakeholders? Does it serve the citizens, the business owners, the developers shareholders, the public interest, public safety, multi-modal transportation, transit visibility, buskers, sidewalk chalk artists, customer or even drivers in the congested parking lots? The thought was there, but with a little intellect everyone could have won much larger. Laneway Housing in Kamloops has its common association with Vancouver, but in fact Laneway Housing primarily has its roots in early 16th Century London. As West London was rapidly developing around the River Thames and the palaces along Whitehall, the ‘abode de jour’ for the upper classes we’re 6-7 story Row Houses. Great examples of this aristocratic housing still survive all over West London, from Covent Garden to Westbourne Grove. The Row Housing model was physically mandated at that time to be built on a human scale, even for the richest of the city. They we’re required to build up in order to shorten the distances in order for services and resources to be accessible and convenient. Take this example; at the height of growth in the 18th Century, when the only method of transportation was by foot or by horse, the center of London from the periphery was half a days journey. This was the limit of its growth, as the people in the center of the city would be unable to purchase wood or coal to heat the house, or food to eat, or beer to drink, etc. Even this growth was already achieved at a very dense scale. These limits forced further densification. Originally, most of the poor would live in the outskirts of the city, or seedy industrial areas of East or South London, but it became necessary to get the rich persons servants into the centre of the city. Alleyways, called Mews, we’re constructed the whole way through the luxury row house development, to accommodate stables, storage and other service entrances. These Mews buildings we’re renovated to provide some accommodation above the stables for the servants of the house. Often only a couple rooms and housing as many as 6 servants, the quarters we’re cramped and smelly above the horses, however it provided both employer and employee with a new degree of convenience with the shorter commutes and safer accommodation. The rich areas of town did not become any less safe, in fact they became more safe with the increase of “eyes on the street”. Many of the poor servants now lived in a place where the females would be comfortable walking the streets in the early morning or late night, and the same for their children. With the advent of the train system, the London Underground, then OmniBuses and later still the automobile, the Mews Houses we’re incrementally taken over in entirety to become houses in the alleyways. They also often became independent quarters for low-level professionals who purchased the homes from Landlords in the Row Houses whos fortunes we’re failing. The transition started. As London experienced fantastic growth starting post-WW2, and again in the 1960’s, and to the extreme in the 80’s, the Row Houses facing the streets we’re purchased by property developers to covert each level into “flats”. 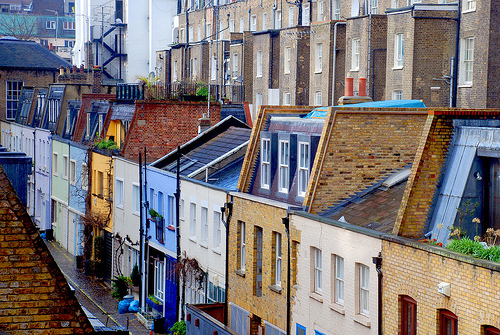 Few Row Houses remain intact in Londons West End, however the Mews Houses do. The Mews Houses are now some of the most desirable real estate in the city. The transition to the Mews Houses was not purely economic though, and the attractiveness of the address is not purely economically stimulated at all. As the city hit heights of population density in the 60’s to such a discomforting degree, the streets became crowded with fast moving vehicles and hundreds of pedestrians. In contrast the Mews Houses stayed on narrow back lanes, unsuitable for fast moving vehicle traffic. 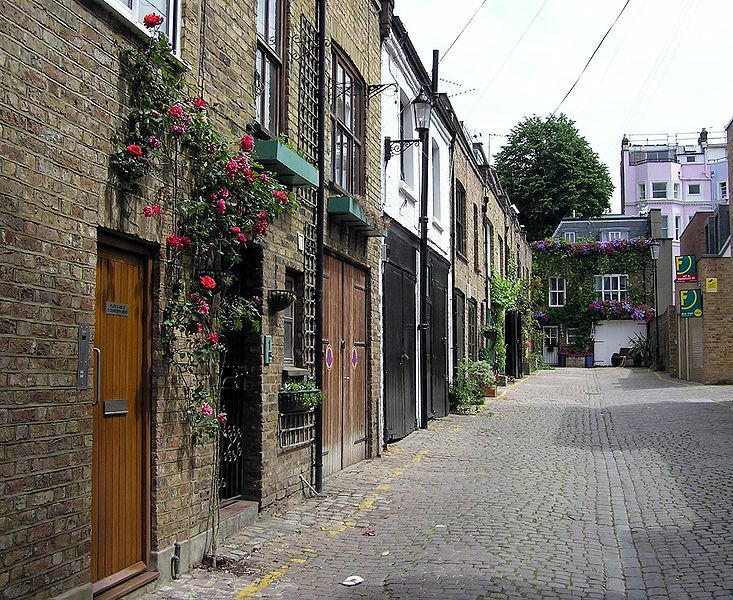 The Mews became an oasis of quiet and calm in the bustling city. It is clear that Kamloops will require extreme densification to accommodate a growing population and diversifying economy. Kamloops’ climate and natural resources make it an efficient geography in which to live regardless of the effects that may or may not be felt from Climate Change and Peak Oil. Current Capital Scarcity make downtown “skyscrapers” difficult to build, as do rising resource costs. Both in the long and short terms, Kamloops is going to need to accommodate many, on its existing infrastructure. Laneway Homes start that transition. These Laneway Houses may be an affordable housing solution immediately, provide a fantastic retirement residence for someone who wants to age in place, or even just create safer alleyways in Downtown and North Shore areas, but they are an established way to treat problems of the present, with a solution that can be adaptable centuries into the future, as London has shown us. A recent blog I discovered through the KunstlerCast that does a great podcast and great advocacy work in the name of New Urbanism and Economics. I lifted this piece from the blog because it is so poignant at the moment, with the WalMart expansion being granted and new subdivisions like Aberdeen Heights given the go-ahead, while large parking lots wait to be filled in downtown. As a developer, I can see the financial sense for a private company to redevelop infill parcels, but until the city gets behind us, we all lose. Without to much more of my input, this is from Strongtowns,org. Many other great articles are here including “Shared Spaces” and “Tactical Urbanism”. In the United States we’ve proceeded for sixty years with reconfiguring our public spaces to accommodate the automobile. The built in assumption of this approach, especially when it comes to commercial property, is that the more cars driving by the better. What we’ve overlooked in our haste to “modernize” is the lower return on investment we get from this approach, even under ideal conditions. Today we need the humility to acknowledge that our ancestors — who built in the traditional style — may have known what they were doing after all. After a nice break, we want to welcome everyone back and wish you all a fantastic 2012. We’re still dedicated to publishing this blog at least three days a week (typically Monday, Wednesday and Friday) as well as releasing a podcast every week or two. We’ve got one other channel here we’ll be starting next week, so stay tuned. If you’d like to stay informed with what’s going on with the Strong Towns movement, sign up for our newsletter. We don’t share your address and we don’t spam. We do bite though, at least rhetorically. Highway 210 runs east/west through downtown Brainerd. In the hierarchical road system, it is the top of the pyramid and would be classified in most places as a “major arterial”. It is designed as a STROAD (a street/road hybrid), attempting to apply highway design standards to what otherwise would be an urban street. In doing so, it has dramatically transformed the land use pattern of the area. The picture below highlights two blocks that front the highway corridor. The one on the left, which we’ve labeled “old and blighted“, is a block that has retained its traditional development pattern. To the right we have identified the “shiny and new” area, the block that has recently been transformed to an auto-oriented development style, to the glee of city officials and local economic development advocates. In between is a hybrid of the two; part traditional and part auto-oriented. The old and blighted area is a collection of run down, marginal establishments. There are two liquor stores, a pawn shop, a barber shop, a bankruptcy attorney, a campaign headquarters, a retail establishment, a cafe and a vacant building. This is not a desirable area. If the adjacent highway didn’t already ensure decline, local “improvements” have degraded what little pedestrian connectivity may have existed to the adjacent areas. None of it that remains is easy, natural or inviting. In the community’s eyes, this is an area that is waiting to redevelop, to transform itself fully into an auto-oriented pattern. That transformation has begun; note that the very westerly building, which is a liquor store, has turned two lots into a parking lot. By contrast, the shiny and new area contains only one business, that being a new Taco John’s drive through fast food restaurant. The modern facility contains two drive-through lanes, good access to the adjacent streets and all the parking that would ever be needed. They’ve done on-site stormwater retention (the environmentalists applaud) and modern signage. 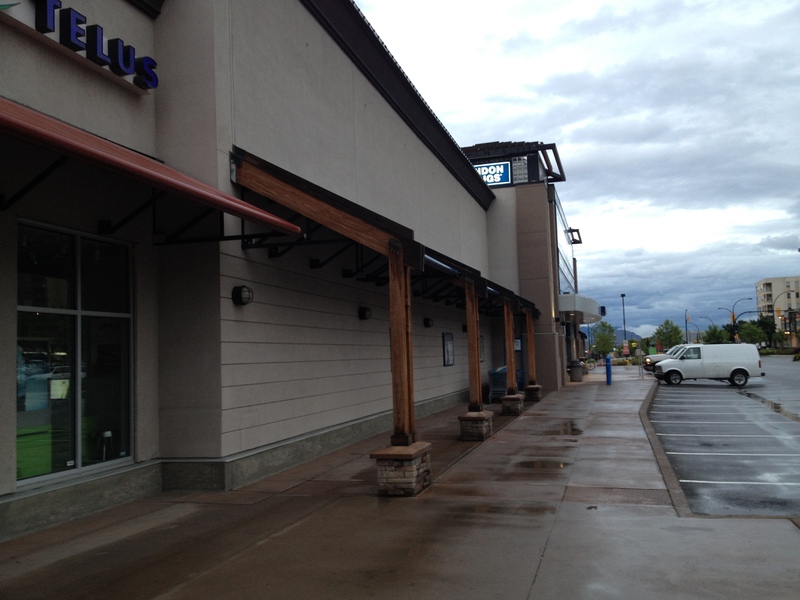 It meets all of the city’s design and zoning codes. The restaurant replaced some buildings that were, themselves, part of an evolution from the original, traditional development to the auto-oriented. With the new Taco John’s, the transformation is complete. If there was any question regarding the public’s opinion on these two lots, the city of Brainerd’s comprehensive plan specifically calls for the transformation of areas that we’ve labeled “old and blighted” into “shiny and new“. The city has designated this areaGeneral Commercial, expressing a desire to see the development along this corridor become highway-oriented. This they describe on page 93 of their plan. The purpose of this category is to identify portions of Brainerd that should contain general retail commercial uses adjacent to the arterial highway system. The intent of this designation is to provide areas for highway-oriented businesses. Consequently, having a strong general commercial base in the city helps the downtown as well. Having a strong highway commercial area helps draw consumers to the city and provides for a healthy downtown. Examples of these could include highway-oriented businesses such as fast food restaurants, convenience stores, gas stations and other auto-oriented businesses as well as a number of large retailers. In that definition of General Commercial, it is stated that a “strong highway commercial area….provides for a healthy downtown.” The problem is that “strong” and “highway commercial” are — in almost all cases — mutually exclusive terms. The numbers prove the point in this case. The eleven old and blighted lots — some of the most undesirable commercial property in the city — arranged in the traditional development pattern along the incompatible, major arterial of Highway 210 have a combined tax base of $1,136,500. To compare, the Taco John’s property — the one that is not only shiny and new but configured precisely as the city of Brainerd desires the old and blighted properties to someday be — has a total valuation of only $803,200. At its nastiest and most decrepit, fighting the negative auto traffic speeding by and the absence of pedestrian connectivity, lacking all natural advantage from the neighboring land uses that would ideally accompany a traditional neighborhood design, the old and blighted traditional commercial block still outperforms the new, auto-oriented development by 41%. Imagine how much more valuable this traditonal block would be if the businesses were simply given some relief from the speed of the STROAD-induced traffic and/or provided some connectivity to the adjacent neighborhood, two things that could be done far cheaper than the millions the city has spent to make this area the dominion of cars. Imagine how much more prosperous we would all be if we started building Strong Towns. Make Kamloops a stronger place by following civic issues. Subscribe to this blog, and make your voice heard.